BitTorrent Sync on Tuesday saw a huge update in its subtly-named 1.4 release, now allowing users a much simpler way to start sharing synced folders with others. If you haven't been using BitTorrent Sync yet, you probably will start soon, largely due to some of the new features they've added today. BitTorrent Sync began a little over a year ago as an internal experiment over there to answer a question: can we use the robust BitTorrent protocol to share and sync files? The answer is resoundingly, "yes!" Dropbox users will understand the concept of syncing a folder amongst multiple computers. Where BitTorrent Sync differs is that it requires no server. It requires no account with BitTorrent. And it requires you to use no one's storage except your own. Set up a folder, tell it to sync, configure that same folder on another one of your computers – or a friend's computer – and you're finished. The two will find each other across your local network OR the Internet, and the syncing commences. That's it. No server account to manage, no cloud storage to pay for, no nothing. That's been the beauty of BitTorrent Sync for the last year-plus. Because BitTorrent Sync started out as an experiment, though, the user interface (and entire user experience) has betrayed that experimental feel, up until now. With version 1.4 there are some fundamental changes to the way you can interact with BitTorrent Sync, and this will make it even easier for you and others to use it easily. 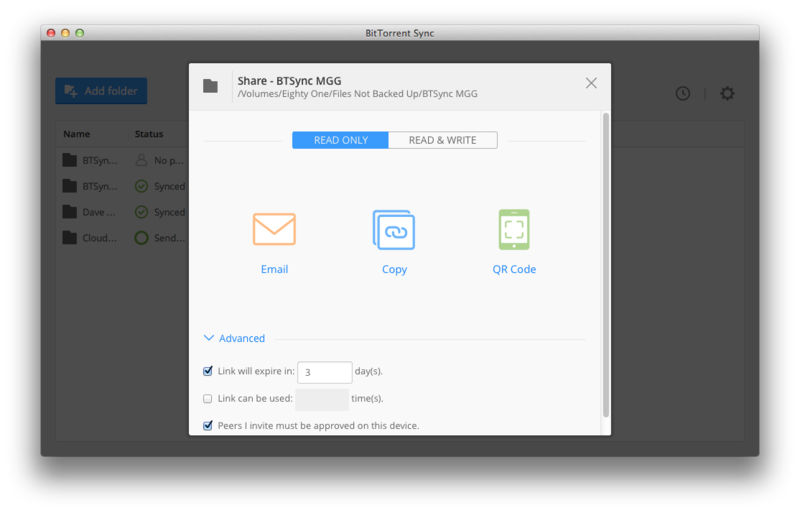 The biggest change in BTSync 1.4 is a new workflow to allow sharing with other users. Previously you had to send other users a key that they would have to paste into their copy of BTSync. That's still possible, of course, but now there's also a much easier way: with a web link. That web link starts up a workflow that makes it very easy for others to sync data with you, even walking them through setting up BitTorrent Sync for the first time. If they already have it installed it gets even easier... it just finds the app and adds the folder to it. Best of all, BitTorrent Sync is still 100% free. Go grab version 1.4 today (Mac, Windows and Linux versions – for NAS devices – are available now, iOS and Android versions are coming to the stores later this afternoon) and check it out!